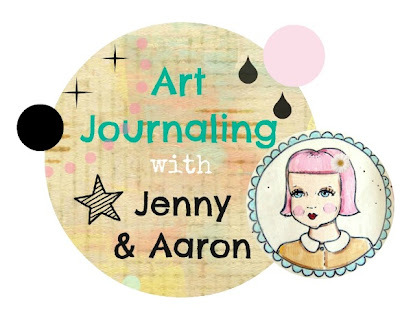 We're beyond excited to have all of you back for our third installment of Art Journaling with Jenny & Aaron! We have so so many plans for future classes that will cover a wide range of techniques, mediums, and tools. In these initial classes we're hoping to cover the basics and get everyone comfortable in creating mixed media pages in your journals. If you've been participating since week one you'll begin to see a specific pattern in the way we like to put things together. And of course, all of these tips and steps are never meant to be seen as "rules". Art Journaling is meant to be a very free art form. Our role here is less teacher, and more helpful-well informed-cheerleader. We're sharing some of our favorite methods because we know that these things work for us...and hopefully they'll do the same for you! So now that it's week number three, we have successfully created spreads in three separate journals. First we used Aaron's marble composition notebook, then Jenny's moleskine, and this week's pages are in Jenny's Strathmore Visual Journal. We'd like to say that we did it this way strictly for our student's benefit, solely to show you guys the range of possibilities no matter what type of journal you own. But we also did it for our own selfish reasons ; ) Because we wanted to work on pages in each of our books...simply for our own bit of fun! So, without further ado...let's get to class # 3, in Jenny's Strathmore Visual Journal. It's got a larger page size ( 9 x 12), a ring binding (no need to reinforce with tape), and heavier stock pages (no need to reinforce with papers). gesso your page. Brush a thick coat of gesso onto your pages. We used Blick Artists acrylic gesso. Let dry. choose spray colors. On one of our pages we're using a stencil and some acrylic mists by Mister Huey. These are a really cool product because they blend right there on the page. We often spray a couple of colors over our stencil to get the desired color on our pages...like mixing a blue and a green to get the perfect aqua tone. Just spray one color and then the other. lay stencil. I knew I was only looking to get the stencil pattern in the middle of my page so that's why I weighted down the edges of the stencil with butter knives (the butter knives elicited an eye roll from Aaron). You can use little bits of masking tape to hold down your stencil. You just want it to stay pretty flat while you are misting. I wish I knew the brand of this stencil but there is nothing on it to indicate the brand. I got it years ago at Michaels. It's really just a laser cut foil-like paper...but I use it like a stencil. Definitely lay down some newspaper behind/around your journal...there is a lot of overspray. mist. As I said, I'm mixing colors...so spray one, and then spray the other til you get the mix you desire. dab. I'm not looking for my pattern to come out perfect...I'm going for a more watercolory, hazy patterned look. Dabbing it right through the stencil while it's still wet will give you this effect. remove stencil. Removing a stencil when using Mister Huey's is easy. It's a lightweight mist that isn't drippy at all. So you can just lift the stencil and reveal the magic beneath. Let dry. mix a wash. Just add a bit of water to some acrylic paint. I'm using a brown tint to give my pages an antiqued look. apply wash. With a 3/4 inch brush apply the wash to your page...thin the paint to your desire. I was able to brush the wash on the entire page before having to dab it due to having coated the page with gesso earlier. If you'd like even more "open time", you can seal your pages prior to doing a wash.
dab wash. Dab with a clean dry paper towel to achieve a mottled, parchmenty look. add more wash. Again, I'm not looking for a perfect stencil pattern. In fact, I'm going for a deconstructed, beat-up, and worn feel. So I brushed the wash around the edges and crept into the middle section just a bit. But I didn't want to totally deconstruct it. Mister Huey's will smudge right into nothing unless it is sealed...so only brush the wash in places where you want the pattern to smudge away. dab & blot wash. I dabbed and blotted, turning some of the aqua pattern into an antiqued blur...but I left the center untouched so that I'd retain some pattern. Let dry. seal your pages. Now that the pages are dry, apply a sealer coat of matte gel medium. I use Golden brand. This will keep your stencil pattern intact and keep your antique wash just the way it is. Let dry. adhere papers. After selecting papers and choosing where they'll go on your spread, then it's time to make your final tears and cuts and adhere them to the pages. To adhere papers brush on decoupage medium and lay the papers on the wet medium. It's better to be generous with the medium. If you apply too little you won't get good adhesion. Smooth and rub to eliminate ripples and bubbles. let dry. We never brush right over top of papers that we just adhered to the page. We find that you get much better adhesion if you decoupage them down and then let them fully dry before applying a sealer coat. seal papers. When dry, apply a thick even coat coat of matte gel medium over your spread. mix gesso wash. The same as a paint wash. Just water down gesso until it's the consistency you desire. In this case I'm looking to simply "cloud" the colors and patterns of my spread. So it's just a skim milky type of wash.
apply gesso wash. With a 3/4 inch brush apply the wash over desired areas and dab away with with paper towel. mute papers. Some papers and patterns I wanted to soften a lot, so I applied a thicker gesso wash and didn't dab as much of it away. back photos with watercolor paper. To back it with watercolor paper just brush decoupage medium onto watercolor paper, lay the photocopy down on the wet medium, and smooth out just like you did when applying your papers to your pages. Let Dry. cut out photos. Cut away the excess watercolor paper. adhere photos. Now adhere the photo in the desired spot using the same method as above. We often use a clean, dry paper towel to press down photocopies just so our possibly damp fingertips don't muss the picture. Let dry, and then apply a sealer coat of matte gel medium. The sealer coat will protect your photos etc. from the speckling and washes in the next steps. mix speckle wash. Our speckle wash is dark but that doesn't mean that we used more paint in the water to paint ratio...we simply used a darker color. The wash is probably the same consistency as our previous washes. speckle pages. We use a #6 round brush...load it with the watered down paint...hold the brush a few inches above your page...and just tap the metal end with your index finger. Do it to your desired effect. We love speckling for it's imperfection. It's messy and haphazard and perfect in it's own way. bottle cap rings. 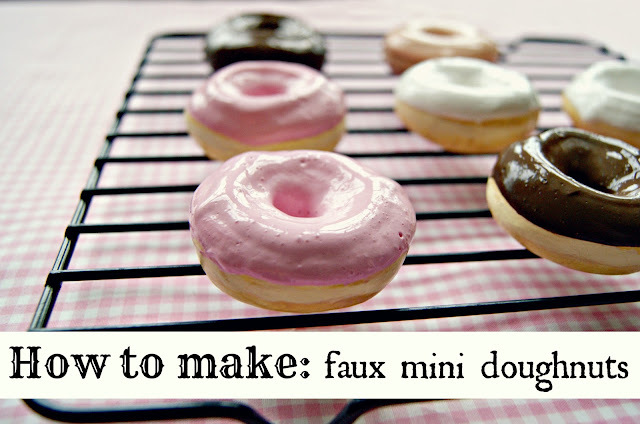 Again, we love the messy, imperfect look that bottle cap paint rings provide. Just apply paint to the rim of the cap and then press down on your page. glue stick dots. We seem to always add messy, randomly spaced polka dots. We do this by either dipping a glue stick into paint or the eraser end of a pencil. Just dip your round tip object into whatever paint color you like and press dots onto your pages in areas that might need a little pop of color. add sepia wash. This whole spread has a time worn, sun faded appearance. After getting to this stage, with a lot of our imagery in place, we felt it needed an overall sepia wash. Tan paint, brown paint, some water. An easy way to get that tobacco stained, aged effect. brush around images. When you brush the sepia wash around your imagery you are able to age the overall page and still keep some of the images a bit more vivid or bold. And again, blot and dab with a paper towel. distress edges with paint. We love to "distress" the edges of our pages with paint. In this case we used colors that gave an antiqued feel...browns and tans. This process is very imperfect. Just dip your thumb or finger in paint and rub the very edge of the page. add fun bits. Adding fun bits is the fun part. These bits of ephemera are what will set off the look of your entire spread. Ribbon trims, ticket stubs, date tags. grab your sharpie pen. Please get well acquainted with your Sharpie pen. In fact, make it your best friend. It's an invaluable tool for any Art Journal. It's a way to personalize any spread...not only by adding personal details...you personalize it because it's your imperfect hand that's doing the rendering. Your doodles are never the same twice and can't be bought in any store. add faux stitching. Faux stitching gives any "store bought" detail a hand rendered effect. more stitching. And vary your types of faux stitching..."sew" each piece on using a different type of stitch. add washi tape. Washi tape is so great for Art Journaling. It's often one of the very last elements we'll add to a page. It's great to add to the corner of a photo...gives it a taped in, scrapbooky feel. accent elements with pen. Now, beyond your doodles...this is more about taking the imagery that's there and accenting it with your sharpie pen. In this case we made the roses stand out a bit more...pulled them from the background into the foreground. Even if you cannot draw per se...it'll look like you can if you just follow along with the lines of the image. outline elements with pen. All of those glue stick dots look better if you give them a little outline. They will pop more and again, they look more hand done...especially if you purposely don't do a great job at outlining them...purposely make your lines start and stop instead of one fluid stroke. handwritten words. Instead of writing directly in your journal, grab a piece of watercolor paper and write out a phrase or two. We used a Sharpie pen but went very bold and big with our letters. Then cut out each individual word, or even each letter if you'd prefer, and adhere them into your journal. Your words will pop more and you'll add texture and interest...and the bright white watercolor paper stands out. consider your pages. You might be done...or maybe not. You've been working on your pages for quite a while so it might be a good time to take a break for a few and then look at your spread with fresh eyes. more faux stitching. We did exactly that. We thought the page was done...but then we saw that the bottom of the page needed more of a human touch. Up top has all that stitching on the scallops, so we balanced it by adding faux stitching to the big polka dots on the bottom of the page. feeling good! Are you happy with it?...do you need more washi?...more doodles?...more dots?...is there anything else you'd like to say? looking good! hmmmm...you just might be done. It's totally possible. Hooray! Yes, you are done! *All other papers are vintage. Thanks so so much again for joining us! We had a lot of fun with this third installment...mainly because we've been seeing how you guys have been following along and implementing a lot of the tips and tricks into your own Art Journals. When we put these pages together it felt like you guys were in the room with us. Honestly...and not in some corny way...this feels like a group effort. There will be a lot more nitty gritty details in the weeks to come. Please grab the badge above to share on your page and please link up below to share your Art Journals with us. Blog about it like crazy...we wanna see...and everybody else wants to see too! til next Thursday! Keep Art Journaling! Eep, so excited to see this! I only have time tonight for a quick link up, to gush about your art as usual (but always well deserved) and say how much I LOVE THIS WEEK'S SPREAD, let you know that I totally borrowed a bunch of your elements/styling ideas from week 2 in my linked up journal pages... and say that I can't wait to read/take this class in more depth! This is so cool. I'd love to do that one day. Il come back here for new updates. Absolutely FABULOUS!!!! I am in love with your journals!!! Of course this weeks... ummmmm now I have the Breakfast Club's song in my head! lol!! I just stumbled across this blog and I'm absolutely in love ! Keep up the great posts and I'll be sure to check back often! Have a great day ! I love how you demonstrate the process... it's almost relaxing to watch! fyi - I think the Veteran link is yucky spam? Goodness, this is so much fun and I'm learning so much...I love the combined video and written instructions, very easy and fun to follow. And it Does feel like a group effort! Thanks a million cupcakes and can't wait to see more!! PS: Love your gorgeous Sweet Dreams girl!! this is so good! Thank you for the tutorial!!! I want to do this!!! I like yoru blog and will definitely be back!!! I look forward to your journaling videos. Makes my day very happy!!!! Wow, that is an amazing journal and nice effect! Loving your art journaling series - so much inspiration. 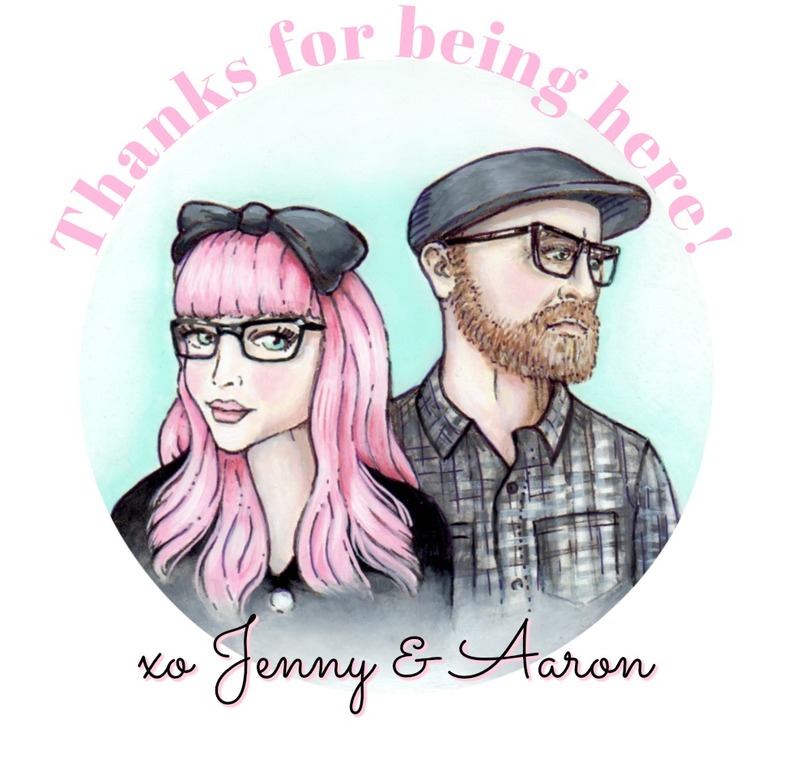 You and Aaron put so much work into this - thank you so much for sharing yourselves with us all!! 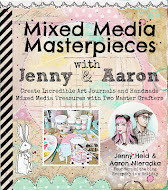 Jenny and Aaron, I am loving your classes and I am still doing them... and I'm finally getting caught up. I'm going to post my class three and four together.